The Child Development Agency (CDA) is boosting the capacity of workers within child care facilities to serve children with disabilities. The Agency recently partnered with the Nathan Ebanks Foundation to provide training for some 20 staff members from residential child care facilities islandwide. The course was designed to help teachers and administrators understand cognitive, developmental and learning disabilities, how these disabilities affect learning and achievement, and provided a tool kit of practical easy-to-implement strategies to boost learning. 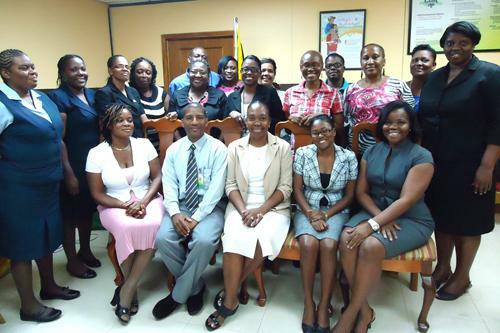 Acting CEO of the Child Development Agency Rosalee Gage-Grey said that the Agency is committed to building the capacity of its officers to serve the children in State care with special needs. Currently, there are approximately 600 children in State care who suffer with various forms of disability. Founded in 2007 by Christine Staple-Ebanks, the mother of Nathan diagnosed with cerebral palsy at age nine months, the Nathan Ebanks Foundation (NEF) is a registered non-profit, centered on children and youths with disabilities and special education needs. Its mission is to ensure that children with disabilities and special needs are given access, resources and the opportunities to be included in life. Ms. Staple-Ebanks noted that the course which was developed for the CDA was specifically designed to provide participants with practical skills to promote quality child development and education for children and adolescents with disabilities. It also aims to share best practice special education strategies to improve the outcome of children and adolescents with disabilities and other exceptional needs of the learning environment. The course also facilitated exposure to a resource kit of creative ideas to adapt classroom curriculum, and instruction to reach and teach mix ability classes, and provided knowledge and skills designed to provide meaningful and tailored plans to help each child achieve, Mrs. Staple-Ebanks said.